What is the Fed Chair able to do without the rest of the FOMC? They say the FOMC operates on consensus, but obviously there are disagreements between members all the time. In practice, Chair have always listened to FOMC governors. But I've never seen a report where the Fed Chair's view was in the minority and he acceded to the majority's will, and my impression is that there's no way of stopping a sufficiently strong-willed chair from doing what he wishes, at least in the short term. 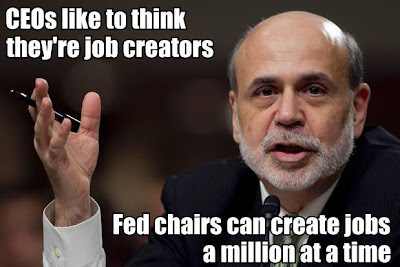 "Job creator" is an attempt to give personality to trickle-down economic theory. 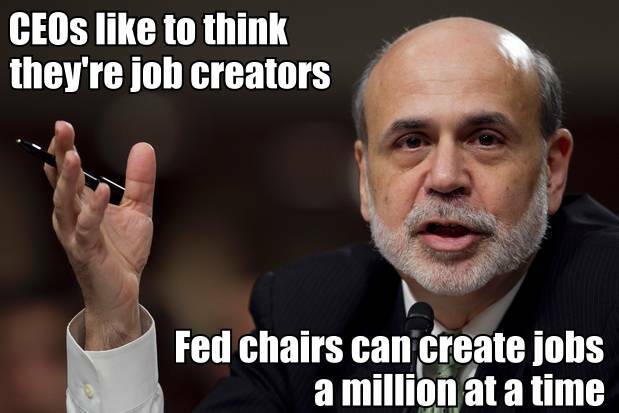 Job creators never have to worry their heads about demand; they are concerned only with the supply side. I hope that David Stockman feels at least a twinge of guilt now and then.